Charlie Wagner, legendary tattoo artist, at work in the Bowery, circa 1947. The story of how the tattoo worked its way on to American skin in the 1800’s is unique to New York City, a place that is now considered one of the global hubs of the arts world and a place where seeing people with tattoo sleeves is just a part of everyday life. Last year a New York Times article reported that the Food and Drug Administration estimated that as many as 45 million Americans have tattoos. But it was not always this way. In fact, for 36 years there were essentially no tattoo shop storefronts in New York City because the City Health Department banned tattooing from 1961 up until 1997 due to an alleged series of blood-borne hepatitis B cases linked to Coney Island tattoo parlors in the late 1950’s. However, old-timer tattoo artists like Mike Bakaty of Fineline Tattoo, and Wes Wood of Unimax Supply Company agree that hepatitis was actually never linked to tattooing. Wood, one of the people who fought to get tattooing re-legalized, admitted that maybe there was one or two hepatitis cases involved with tattooing, but that was definitely not the real reason for the Health Department to pull the plug on tattooing. “The Health Department’s position was that they were against legalization because they didn’t want to spend the money – they thought it was a waste of taxpayer’s money. They even knew that no one was getting hepatitis or aids. When tattooing became popular people got concerned with that and people got the perception that because there is blood involved people are getting diseases – it’s that perception that drove all this hysteria,” said Wood. 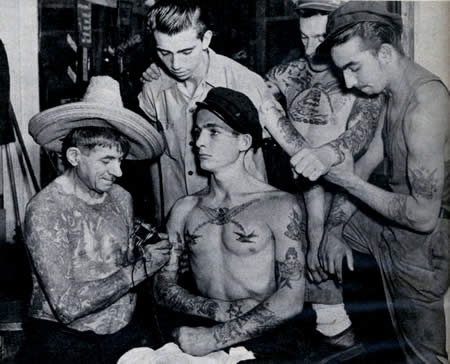 Tattooing was considered deviant and it was associated with those in the realm of macho male drunken sailors, outlaw bikers, thugs, and criminals. “The best reason I ever heard for why tattooing was outlawed came from old Coney Island Freddie (old-school Brooklyn tattoo artist). His thought was that the Health Department was trying to ‘clean up the city’ in preparation for the World’s Fair that was here in ’64 – and that made more sense to me than anything,” said Bakaty. Instead of closing up shop, New York City tattoo artists like Bakaty and Wood began to operate underground for 36 years in secret backrooms and loft apartments until the prohibition years ended. The operating out of secret backrooms was possible because there was not heavily enforced. 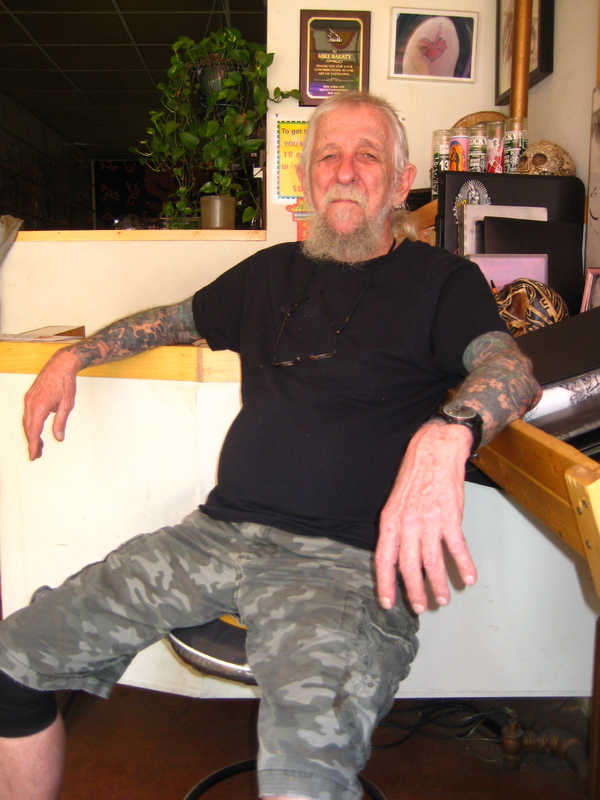 Mike Bakaty opened Fineline Tattoo in 1976 during the New York City ban on tattooing and he still tattoos there to this day. News even though, at the time, tattooing was a violation of the health code. He relocated Fineline Tattoo to First Avenue on the Lower East Side where he still tattoos today alongside his son, Mehai Bakaty. Fineline Tattoo is a small tattoo parlor with its walls lined with the Bakaty boys’ original flash art (tattoo designs) of dragons, eagles, tigers, panthers and Celtic knots. Fineline Tattoo is considered the longest continually running tattoo shop in Manhattan. From the time it was born up, arguably, up until the 1980’s a tattoo not only permanently inked a person’s skin, but it also attached a stigma to that person – today this idea of a tattoo stigma has dwindled. Before one can get into how tattooing has worked itself so deeply into America’s mainstream culture, one must start from the beginning. The birth of tattooing in the United States and a German immigrant named Martin Hildebrandt go hand in hand. Hildebrandt set up New York’s first tattoo shop on Oak Street in lower Manhattan where he tattooed soldiers who fought on both sides of the Civil War. The tattooing that Hildebrandt did on his daughter, Nora Hildebrandt, who is considered America’s first professionally tattooed lady, was the most notable. Not only was getting tattooed socially unacceptable, but a woman who was inked was completely unheard of. Another man highly responsible for the integration of tattooing into American society is a New Yorker named Samuel O’Reilly who opened up a tattoo shop at 11 Chatham Square in the Chinatown area of the Bowery in 1875. The Bowery area and Coney Island were considered the tattoo meccas of New York City during a significant portion of the 19th century and well into the 20th century. Prior to 1891, the tattooing that men like Hildebrandt and O’Reilly did was done by hand. The tattoo machine used by these men consisted of a set of needles attached to a wooden handle. Tattoo artists of this age would dip these needles in ink and move their hand rhythmically up and down, puncturing the skin two to three times per second. Tattooing by hand was an extremely slow practice that took years of experience to perfect, even for the greatest tattoo artists of that time. 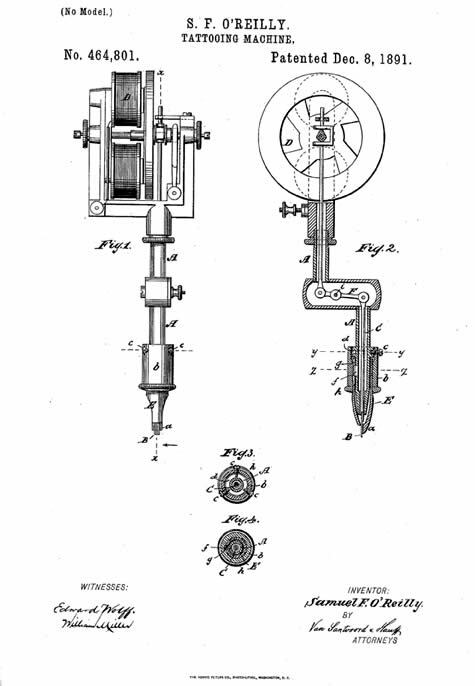 This manual way of tattooing all changed when O’Reilly revolutionized tattooing in 1891 with his invention of the first electric tattoo machine, which was a modification of Thomas Edison’s perforating pen. This invention transformed tattooing into a quicker, more attractive process even though the pain one goes through to get a tattoo will never dissipate. Modern tattoo machines puncture the skin between 50 to 3,000 times per minute. The needle penetrates the skin by a millimeter and deposits a drop of ink into the skin with each puncture. It sounds like a grueling process, I know, but that doesn’t stop anyone who truly wants a tattoo. It didn’t stop me. 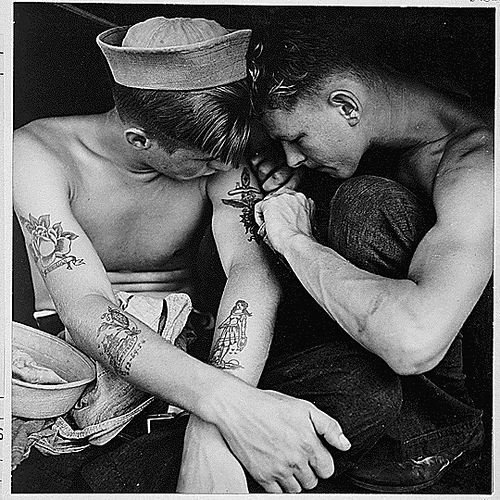 Sailors were the big tattooees of the day, circa 1944. The way tattoo shops were run during the early 20th century are not the way tattoo shops are run today. Bakaty, who opened Fineline Tattoo in 1976 during the midst of the underground atmosphere of New York City’s ban on tattooing, recalled that from the 1940’s up until the mid 1960’s there was virtually no sterilization, hygiene, or running water in tattoo shops – they were referred to as “bucket-shops.” The artist would tattoo next to a bucket of water with a sponge in it, and that same bucket of water and sponge were used to wipe down every tattoo the artist did that day. In those days tattoo artists had to have a sense of how to actually make tattoo machine tubes and needles. They couldn’t just learn the technique from opening a book, like many tattoo artists do today, primarily because those types of “how-to-tattoo” books didn’t even exist. During that age, the tattoo artists had to have knowledge of how the tattoo machinery worked and an understanding of the different types of pigments because tattoo supply stores were just not available the way they are today. However, these same tattoo artists never even thought about sterilization, wearing gloves, changing the needles, or even changing the cups of ink after every client. Bakaty said that when the tattoo was finished the artists would swipe a glob of Vaseline over the fresh ink and stick a piece of newspaper to it – when the newspaper fell off the tattoo was considered healed. “Thank goodness that that’s gone the way of the dinosaurs,” said Bakaty. In 1944 Charlie Wagner, one of America’s greatest tattoo legends, was involved in one of the first instances of legal trouble for the tattoo world. He was fined by the city of New York for not sterilizing his needles. Wagner tattooed in the infamous Bowery for 50 years starting in the 1890’s up until his death in 1953. Wagner took over the shop space at 11 Chatham Square, which originally was occupied by O’Reilly. In 1936 a December issue of Life Magazine revealed that one out of every ten persons in the U.S was tattooed in whole or in part, which translated to about 10 million Americans or six percent of the population. This article also revealed that there were only 60 established tattoo artists throughout all of the United States. According to the New York City Department of Health and Mental Hygiene, there are currently approximately 1,900 licensed tattoo artists in New York City alone. is primarily what got him interested in the world of tattooing. “Tattooing wasn’t as out in the open as it is today. When I started tattooing there were probably 500 tattoo artists in the whole country, to tell you the truth,” he said. When the tattoo ban was inflicted many tattoo artists moved out of the city and preceded to evolve with the art form elsewhere, but for those tattoo artists who stayed the ‘80’s was really when tattooing began to make its way into the mainstream. “It started in the 1980’s when tattooing was becoming a new artistic view – people wanted to disassociate their selves with the American view,” said Wood who grew up in Long Island in the ‘50’s and the only tattoos he ever saw were on Popeye. “America began to see good people had tattoos. When we saw Roseann Barr on television with a portrait on her chest that blew everyone away,” said Wood. Except for women like Nora Hildebrandt, it used to be a rarity to a see a woman with tattoos and now women make up half the clientele for most tattoo artists. By the 1980’s tattooing had become an integral part of society – it was no longer part of a subculture. In 1981 MTV, an American network based in New York City that was the first 24-hour music video cable channel, took over the air waves and had a prominent impact on the music industry and popular culture. During that time, many members of hair metal bands displayed on MTV such as Mötley Crüe, Black Sabbath, and Guns N’ Roses had obscure tattoos on their arms and torsos. Tattoo popularity only grew from there. There is no doubt that television has influenced the general public’s perception of tattooing for better or for worse. Although some stereotypes associated with tattooing still persist, a stigma is definitely not associated with it the way it once was. Present-day tattooing has gotten a massive amount of exposure through the media, Hollywood, rock stars, celebrities ranging from Johnny Depp to Lady Gaga, and kitschy tattoo television programs like LA Ink or Miami Ink. All of these facets play a role as to why it is no longer considered taboo or deviant to get a tattoo. The popularity and acceptance of tattooing has undoubtedly evolved over time and it will continue to evolve. A tattoo is a way to give your skin a permanent representation of who you are and where you’ve been, and judging from the history, there is always going to be a portion of the population that is going to want to get inked. Making it illegal couldn’t even stop the tattoo world from evolving. This entry was posted on Wednesday, May 11th, 2011 at 4:49 pm	and tagged with Bowery, Charlie Wagner, Coney Island, Health Department, Illegal tattooing, Martin Hildebrandt, Mike Bakaty, New York City, Samuel O'Reilly, tattooing, Wes Wood and posted in Tattooing. You can follow any responses to this entry through the RSS 2.0 feed. « What Does The Easter Bunny Have To Do With The Resurrection Of Christ? I enjoyed reading your article. Thumbs up. Thanks Wes! I enjoyed writing it; NYC’s tattoo culture is fascinating. Good history of the tattoo life in new york city and even i don’t know about the details and history.